The following sets are photographed 'as is' and have not yet been cleaned or worked on.If you are interested in one of them please email me for more information. 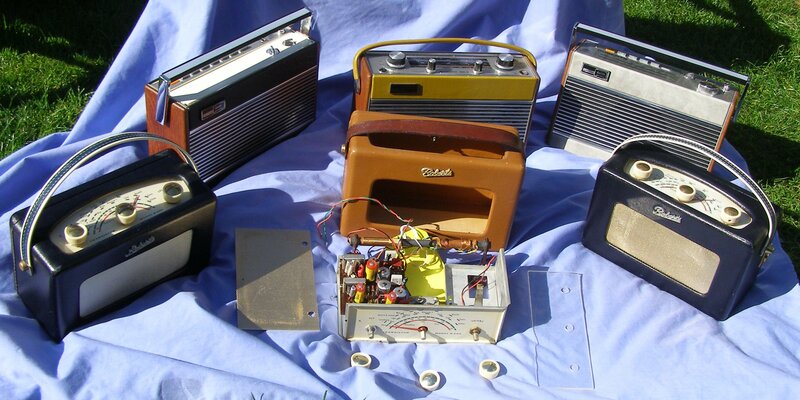 Restored Roberts,Hacker and other manufacturers radios/electronics for Sale from the 50's 60's and 70's. All sets have been serviced and are sold as working. The age of the set 'circa' is the date the model was released for sale. Not the year any set was manufactured. Note: All prices include delivery by courier within the UK. (Mainland only Highlands and Islands extra at cost). Have fun with this Dansette GEM radio and bring back the swinging sixties.Circa 1966.Long and Medium waves. Fully working and converted to AA size batteries. Please note the tear shown in the second picture which is partially covered when the handle is in its upright position. A truly iconic set from the dawn of the swinging sixties. This one is in good condition and sounds great. A quality Roberts set from 1968. This one has VHF as well as Longwave and Mediumwave. Another great sounding transistor radio from Roberts.A few marks on the cabinet but it is 30 years old.This one can also be mains as well as battery powered (mains lead supplied). Very good Condition and complete with original box. Long and Medium wavebands. All sets come with 3 months warranty on the electrical components.Further Pictures or information is readily availiable just Email me.